When you were young, you only had two real outlets for releasing the innate violent urges which dwell deep in each and every young soul. You could accost the other children in your house, on your block, or at your school, but chances are you’d be severely punished for such cruelty. The second option was to play a fighting game, where one could enter the body of a muscle-bound behemoth or a “swift and lightly dressed” young lady and beat the guts out of some strange opponent. For many young gamers, that outlet came in the form of Street Fighter. A classic in the genre, Street Fighter has seen it’s latest iteration, Super Street Fighter IV, undergo a large overhaul into Ultra mode. Ultra Street Fighter IV updates the Super version with new characters, environments, and various tweaks to Super Street Fighter IV’s fighting animations, game modes, options, and numerous other areas throughout the game. 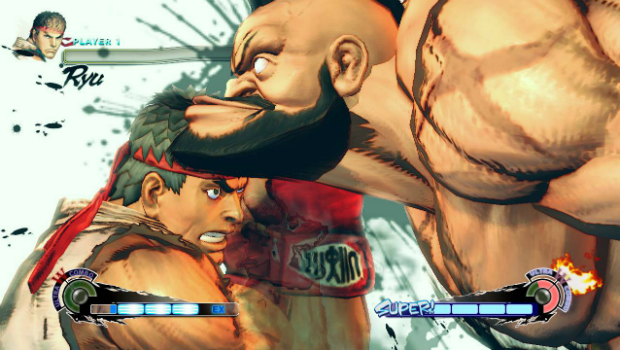 Each change seems to have the players of the game in mind, as feedback from players of Super Street Fighter IV was used in the revamping of the game’s mechanics. Despite having only played Ultra Street Fighter IV (the experience of upgrading from SSFIV will be detailed below), there is evidence that the changes made mechanics-wise are very well done. The direction of attacks is nicely varied across characters, and the accuracy of those attacks is spot on. The distance between fighters is accounted for perfectly as well, and the game even seems to account for the size of the attackers foot, fist, weapon, or other form of damage dealing in it’s ability to hit. The new characters are really great, for the most part, bringing a few new styles of play to the game. The most interesting of the new cast is a giant wrestler named Hugo, who takes up most of one side of the screen. He attacks by going to his knees, twisting, rising, and diving one again to his knees in a nice fluid motion, and he has to reach to evade attack while going on the offensive. His only weakness is that he is a bigger target, as any well placed attack, high or low, will be able to hit him at any time. The other four characters are more standard in implementation but have subtle differences. Decapre is a scientifically altered being with very fast attacks using protruding energy blades from her wrists. Elena is a dancer, and is far too weak to be an effective fighter. The final two, Poison and Rolento, are almost mirror images of each other in terms of fighting style, each carrying a short-range melee weapon. While Rolento’s staff may carry a lot of power, Poison is a much more visually pleasing character to leer at. Each new character comes with 12 or so colorways, each with two special designs, one cel-shaded and the other sketched. Six new stages have been added, and each has nice background action that is quite alive and reacts to the action on the battleground. The best new stage is the Jurassic Era Research Facility, a dinosaur filled island predictably located in “question marks.” The other new levels are pretty non-descript, and while not very poor, the new levels aren’t really that great either. Two new online game modes come with Ultra Street Fighter IV. A 3v3 endurance mode pits teams of players against each other in succession, where the lifebar carries over from match to match. Very fun and a nice way to determine who among your friends is the best fighter. There is also a new online training mode that allows players to train against each other rather than against a computer opponent. That is not very exciting, but it definitely has it’s uses and is a smart addition to the game. After downloading the update from the Xbox Marketplace, I started up Super Street Fighter IV from the main menu. Once past the video intro, Ultra was integrated into SSFIV into a matter of minutes. I was able to get a look at all 44 characters in all the modes. Any of the costumes and other bonuses I had unlocked were available in Ultra. However, I felt that I’d be able to revert back to SSFIV and SSFIV Arcade Edition if I wanted to. It appears that isn’t possible after the conversion is complete. Upgrading for $15 isn’t a bad deal at all. I just wish that some extra incentive was given to those who were upgrading. As we reach the end of this rundown of upgrades and goodies, we finally get to the true essence of what this game is about: fighting. The most interesting changes involve the ultra combo meter at the bottom of the battle screen. Like many other games, the meter at the bottom fills as you land attacks, and when full, allows you to unleash a powerful combo. Ultra Street Fighter IV allows you to choose three uses for the meter: the normal mode with one attack, an Ultra Combo Double mode that allows you to use both ultra combos while losing some base attack power, and the Red Focus mode, where the meter becomes an invincibility power of sorts. Each has it’s benefits and drawbacks, but kudos to Capcom for trying to innovate how that familiar old meter is used. Ultra Street Fighter IV also allows players to choose their fighter from a particular edition of the game with Edition Select, and the subtle changes to attacks and how the character plays is hard to notice for someone unfamiliar with the previous Street Fighter titles. However, there is no drawback in including this function, as it adds further depth to a striking cast count of 44. Ultra Street Fighter IV, I do like thee, even though you have brought out the violent urges of myself and many other young gamers throughout the past few generations. The current generation has not been let down with this ultimate version of a great 2D-style fighting game. Ultra Street Fighter IV is affordable in the face of the high amount of new content the game adds. New characters, new stages, changes to the mechanics, gameplay, and numerous other high-level upgrades makes for a great experience that can be appreciated for a long, long time. Innovations with the combo meter and multiple versions of fighters only add intrigue and depth to a solid effort. A great game well worth a play.